Proline coach Mujibu Kasule addressing the media ahead of the Soana game. Photo by Shaban Lubega. FOOTBALL–Having lost 2-0 away to Police in their last game, Proline will hope they can make home advantage count today against Soana, a team they have never beaten before in the top flight. Proline’s only absentee remains Nuldin Bunjo who has failed to recover from injury but Ivan Bukenya who missed the loss to Soana due to fitness concerns is expected to play today. 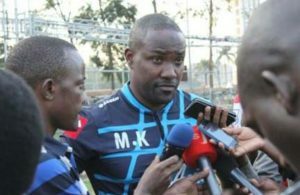 Mujibu Kasule, Proline FC coach, said his club has so far failed to impress on the pitch and especially in the final third. “In football you cannot score unless you create chances and that is exactly what we have not been doing in the first three games of the season. “Hopefuly this will not be the same case today at home and we can get our first three points of the season,” he said. “Hopefully they can play in our favour and we hurt them at their own naivity,” he added. Soana have a fully fit squad for today’s encounter and will hope to gain more points after winning their first game in their last league outing. Both teams go into the fixture on the back of contrasting league results in their respective last league fixtures. Soana won 1-0 at home to Masavu with Proline loosing 2-0 away to Police. Proline have lost four of their last five league fixtures with the only exceptional result being the 0-0 draw away to Onduparaka in the first game of the season. On the other hand, Soana have lost only one of their last five league games (W2 D2) with the loss coming by way of a 1-0 defeat to SC Villa in Masaka. Last season Soana deafeated Proline home and away with the reverse fixture ending 2-1 in favour of the Kavumba based side. Proline have lost all four of their top flight meetings with Soana conceeding atleast two goals in every game. The only positive issue in their losses is the fact that they have always scored at least a goal in every match.